LAWRENCE — Winemakers have added sulfites to preserve their products since the time of the Roman Empire. Sulfites, a class of compounds including sulfur dioxide and sulfite salts, act as antioxidants and antibacterial compounds. They can occur naturally in the winemaking process or can be added by producers to preserve freshness and boost flavor in a vintage. Due to these concerns, since 1988 wines sold in the U.S. containing more than 10 parts per million (10 ppm) of sulfites have been required to include the phrase “contains sulfites” on the label. Now, a research drive at the University of Kansas School of Engineering is working toward the design and marketing of a low-cost, easy-to-use device that would filter up to 99 percent of sulfites from wine when it’s poured from the bottle. “With this project, the idea is to help them develop a product here at KU you could ultimately market and sell — and help instill in them an entrepreneurial spirit,” he said. According to Shiflett and his young researchers, there already are products in the marketplace advertised as removing sulfites from wine — but they have shortcomings. In addition to the high cost for consumers, Shiflett’s group has tested these products and found they only remove some of the sulfites. “We’re showing the current products only remove about half of the sulfite based on our initial testing,” said Maddie Lyda, an undergraduate senior in chemical engineering working on the project in Shiflett’s group. 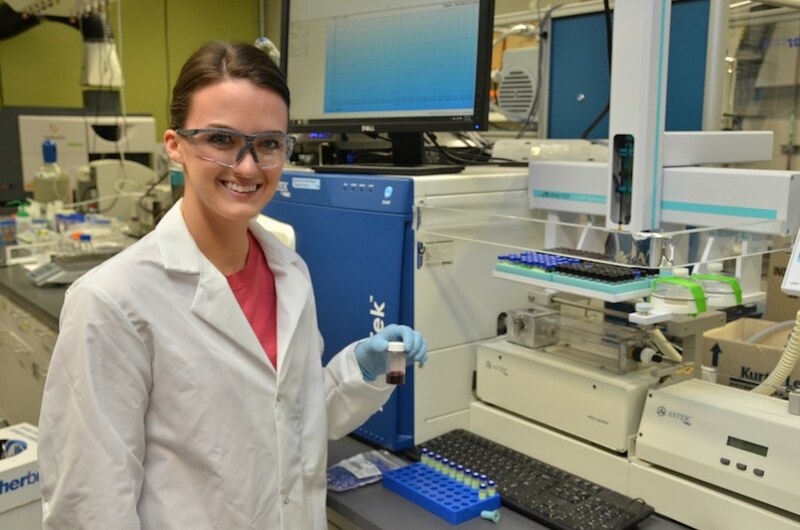 In the lab, Lyda tests samples of materials found in products on the market and screens promising materials the Shiflett group is considering for removing sulfites from wine (and other products like fruit juices that also can contain sulfites). Shiflett hired one of his colleagues from DuPont, David Corbin, a world expert in porous materials called zeolites, to provide guidance on the selection of materials the researchers are testing. Shiflett stressed the adsorbent must remove the sulfites without changing the quality of the wine — a goal that complicates the removal of the unwanted preservative. The KU researcher said if his team could successfully design and build a sulfite filter that easily attached to the end of a bottle, he believed consumers would purchase the device. By contrast, products already available to reduce sulfites require putting drops of a chemical in the glass of wine, pouring wine through a filter set atop the glass or stirring a filter through the wine. Photo: Maddie Lyda, an undergraduate researcher in Mark Shiflett’s group, samples wine using a total sulfur analyzer. The group hopes to develop and market an inexpensive device that removes 99 percent of sulfites from wine. Photo courtesy of KU.